Is your child a great fan of Pirates of Caribbean series? Are you planning to host a “Pirates of Caribbean” themed birthday party for your little boy? 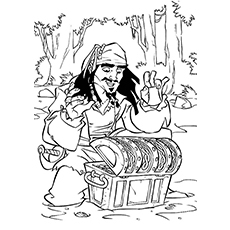 If you are looking for Pirates of the Caribbean coloring pages free to print, then you have come to the right place! Disney’s “Pirates of Caribbean” is a movie series based on the novel of the same name. In the film, Will Turner collaborates with Captain Jack Sparrow to save his father and the love of his life. What follows is a series of supernatural adventures. 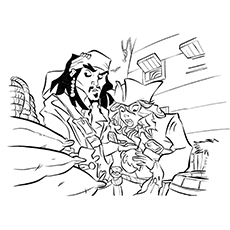 The coloring sheet features Jack Sparrow, the legendary pirate of the series. Johnny Depp, the famous Hollywood actor, portrays the role of Jack Sparrow in the film series. Jack is the irreverent trickster of the Caribbean. Jack embarks on thrilling adventures in every movie, some even involving the supernatural. Will Turner is a major character in this series. He is the son of the famous pirate Bootstrap, Bill Turner. He is a blacksmith by trade and a pirate by fate. He initially sails to save his father, but in the way finds about his father’s real identity. Will learns what it is to be a man after Jack Sparrow involves him in his adventures. 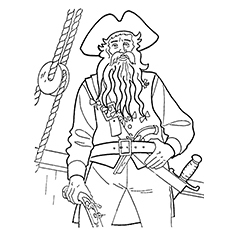 Black Beard, also known as Edward Teach, was a notorious pirate famed for his long, black beard. His intimidating nature scares his enemies. He would light a fuse in his beard to surround his face with smoke. Black Beard was very cruel with his prisoners. He would torture them for his amusement. 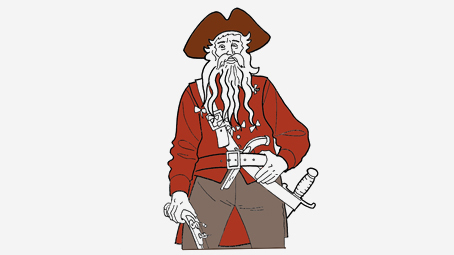 Davy Jones is the legendary sailor and the antagonist in the series “Pirates of the Caribbean”. Davy was once a mortal pirate and a great sailor too. But he fell in love with Calypso, the sea goddess, who saddled him with the duty of the ferrying the souls of the deceased sailors to the Land of the Dead. Elizabeth Swan is the primary character of the series “Pirates of Caribbean”. She is an intelligent, spirited, and independent character. Elizabeth was fascinated with the world of buccaneers. She even learned a song about the pirates when she was a child. Both Will Turner and Jack Sparrow changed her notion of romance and adventure. She later married Will Turner. Hector Barbosa is one of the main characters in the film. He is the archenemy and the nemesis of Jack Sparrow. He was the primary antagonist of the “Pirates of the Caribbean: The Curse of the Black Pearl”. He stole Jack’s ship and entered alliances with his rival while being his mate. 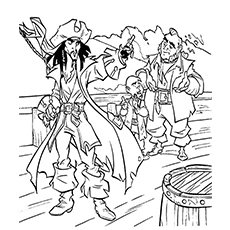 Barbosa and his crew fell under a curse following a mutiny against Jack Sparrow. Meet Bootstrap Bill Turner, one of the associates of Jack Sparrow. He is also Will Turner’s father. Bootstrap is a slender man who always wears a bandana. He also wears starfish on his face. 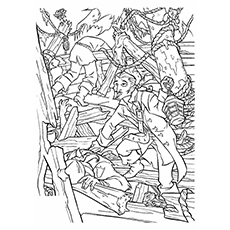 The coloring sheet shows Bootstrap trying to get rid of a crab. Mr. Gibbs, formally known as Joshamee Gibbs, is the right hand of Jack Sparrow. 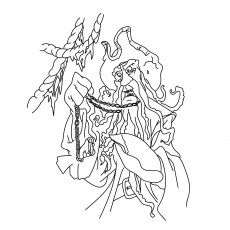 He provides the audience and cast with the background information as we can see on the coloring sheet. Gibbs is the only character who knows Jack’s history. He is an elderly man with gray hair and blue eyes. Kraken is the sea monster from the “Pirates of Caribbean”. He is a legendary sea monster of giant proportions. Kraken plays a crucial role in the series. We have seen her appearance in almost all of the Pirates of Caribbean films. Captain Davy Jones commands Kraken. 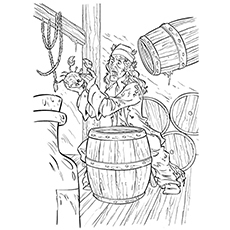 Here is one of the interesting pirates of the caribbean colouring pages featuring James Norrington. He is an important character in both movie and book. Norrington is highly skilled in firearms and swordsmanship. In fact, even the pirates fear him for his swordsmanship and nautical skills. 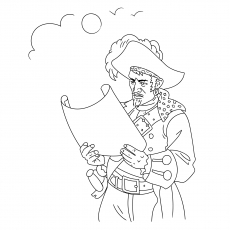 The coloring sheet shows James reading a map. 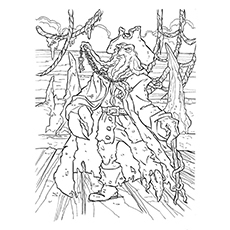 So, print all these free printable pirates of the caribbean coloring pages to give your kids hours of fun. You can also hold a coloring competition on your child’s birthday party. Reward the child who colors most neatly. Don’t forget to share the result with us. Happy coloring!